I love to take apart older pieces that are no longer worn and remake them into things that I love anew and give new life to the old. I've already shown a couple of things I've made for others from pieces they've been given and not worn that I've remade. You can see them here and here. I still have lots of my mother's old stones and pendants that I want to make into pieces that I will wear. I also have her gold watch given to her for her 21st. The face is so small you can hardly see the time but it is a memory of my mum. She wore that watch for years and along with the wedding rings of mum and dad, I'd love to incorporate them into something I can wear myself. This necklace was made using one of the old coral chip necklaces so popular in the early 1980s. I hadn't worn it for ages so took it apart, added some colour and some wood beads. Cate from the blog Heart on My Sleeve has re-purposed a turtle necklace. She loved the beads but never felt comfortable wearing so used the turtles in other ways. Cate shows both her re-purposed work and that of others in her blog. It's worth a look. Here is one she made into a brooch using an old earring loop. If you'd like me to link to your re-purposed works then provide the link in the comments section. Your idea for repurposing chips is BRILLIANT! I may have to steal your idea and give you credit if I write it up! I love recycled and repurposed work. I create jewerly that from recycled hardware. 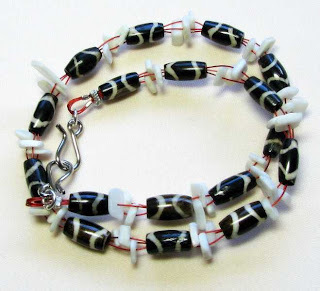 Your piece with the wood bead is very cool with the red wire, and Cate's work is lots of fun too.